Graves’ orbitopathy (GO) is an extraocular eye disease with symptoms ranging from minor discomfort from dry eyes to strabismus and visual loss. One of the hallmarks of active GO is visible hyperemia at the insertion of the extraocular muscles. 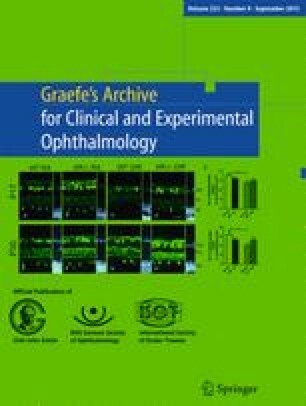 The aim of the present study was to evaluate the use of enhanced-depth imaging spectral domain anterior segment optical coherence tomography (EDI SD AS-OCT) for detecting pathological changes in horizontal recti muscles of patients with GO. Prospective cross sectional study of 27 eyes. Only women were included. EDI AS-OCT was used to measure the thickness of the tendons of the horizontal recti muscles in a predefined area in patients with GO and healthy controls. EDI AS-OCT was able to image the tendons of the horizontal recti muscles in both healthy controls and patients suffering from GO. The mean thickness of the medial rectus muscle (MR) tendon was 256.4 μm [±17.13 μm standard deviation (SD)] in the GO group and, therefore, significantly thicker (p = 0.046) than in the healthy group which had a mean thickness of 214.7 μm (±5.516 μm SD). There was no significant difference in the mean thickness of the tendon of the lateral recti muscles (LRs) between these groups. This is the first report showing that EDI AS-OCT is suitable to detect swelling at the insertion site of the MR muscle in GO. MR tendon thickness may be a useful parameter to monitor activity in these patients.